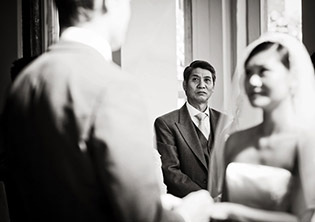 There are two main types of wedding photography which seem very popular at the moment: Traditional and Contemporary. Traditional wedding photography provides for more classically posed images and a great deal of photographer control and interaction on the day of the wedding. The emphasis in contemporary wedding photography is to capture the story and atmosphere from the day, so the viewer has an appreciation of what the wedding was like. 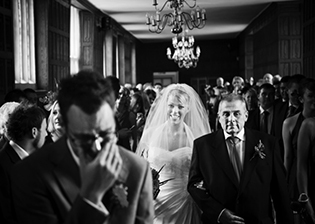 The main stream of contemporary wedding photography is photojournalistic in style and content. It takes its cue from editorial reporting styles and focuses more on natural, un-posed images with a little photographic interaction. The advent and advancement of digital cameras means that many people can offer their services as wedding photographers but contemporary wedding photography is more than taking informal photographs and involves the use of composition, lighting and timing to capture photographs that have a strong visual appeal. The photojournalistic style can offer clients a choice of getting something that is completely uncontrived, concept free and ultimately, truthful. The other two main streams of contemporary wedding photography are informed by fashion and glamour. Undoubtedly these styles require a great deal of expertise, imagination and skills, but it is not for everyone. If a client feels that they want to go down an exclusively fashion/glamour route the there are plenty of photographers out there willing to oblige. However, the point here, perhaps, is that one should forget the glossy’s for a few minutes and consider what it really is, overall, that one expects and desires from a set of wedding day images. Couples are often worried that contemporary/photojournalistic wedding photographers do not take wedding portraits or group pictures. Many photographers (like ourselves) who embrace the photojournalistic ethos still make concessions to their clients by taking a few set-up shots. Photojournalistic wedding photography is not, or at least should not be a random, ‘machine-gun’ process but in fact, and when executed well, is just as thoughtful and considered as any high-end glamour shoot – more so perhaps since it is not a question of ticking boxes but rather one of opportunism, a sort of highly concentrated voyeurism and the recognition and capturing of the countless little narratives and sheer emotions as they unfold throughout the day. In the end, clearly, it is a question of preference, but a significant number of clients, in our ever increasing experience, have a clearer idea of what they think they expect rather than what they actually expect. This is not to say that the majority of our clients are not thrilled with our work, but rather to point out that there is a very real danger that other clients may not be, simply because of a mis-match of expectations. It is precisely these expectations which need to be considered very carefully and at a very personal level, far away from the web-sites and the magazines, before choosing your photographer. 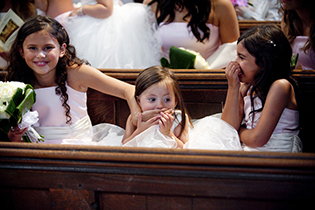 AJ Williams Photography - reportage and contemporary wedding photography styles by London based professional wedding photographers.